Amy's radio show 'Kiss My Arts' on Joy 94.9. 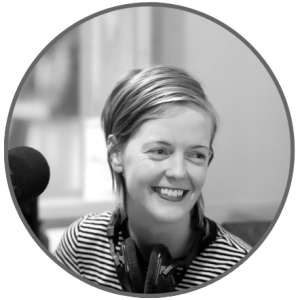 As Monday-itis draws to a close, kick back, relax and fill your glass with a generous dose of reviews, interviews, tunes and hilarious chat as Amy brings you the latest in new music. Hear it first and hear it live on Kiss My Arts. Tune in from 9pm on Mondays on Joy 94.9. What has Kiss My Arts been up to? In 2012, Kiss My Arts has interviewed, featured and reviewed over 100 artists and bands, over half of which are independent Australian artists. Kiss My Arts has broadcast over 60 live-to-air studio performances of new (and often unreleased) songs by indie bands and artists…and we’re still counting and going strong for 2013! Are you an artist or band trying to get noticed? If you’re an upcoming artist or band, I’d love to hear from you! On the Kiss My Arts show, we’re always keen to check out new talent and make new musical friends. We’d love to review your latest album or gig, play some of your tunes on our show and even get you into the studio for an interview. Get in touch and get your music out there! We’ve interviewed the likes of British India, Bombay Bicycle Club, The Presets, Julia Stone, Ben Gillies (Co-founder and Drummer of Silverchair/Bento), Butterfly Boucher, Hermitude, Jordie Lane, Saskwatch, Alpine, Jack Carty, Polo Club, JD Samson, and Georgie Fair to name a few. We’ve even interviewed Yann Tiersen…yep, the guy who wrote the music for the film Amelie! You can tune in to the Kiss My Arts show on Monday evenings at 9pm on Joy 94.9 (FM) if you’re in Melbourne. If you’re from outside Melbourne, you can stream the live show online. We’re also on facebook and twitter, so feel free to like us, follow us, read our reviews, and contribute your comments. Do not fear. You can listen to previous episodes of Kiss My Arts. 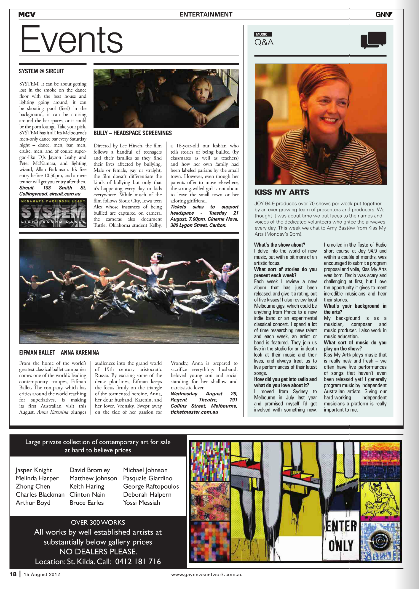 Kiss My Arts host and producer, Amy Bastow, interviewed in MCV magazine.